Although pork and cabbage is a more traditional New Year’s Day meal back in West Virginia, I’ve adapted to the south with its collard greens and black-eyed peas. Tradition dictates that you eat greens (whether cabbage, collards, or some other kind) to represent folding money. Black-eyed peas represent coins. Pork is traditional because pigs root forward. You should never eat chicken on New Year’s since they scratch backwards. Regardless of what you eat today, here’s my recipe for collard greens, delicious (and good for you!) any time they’re in season. Strip the greens from the ribs (fold them in half and just pull the rib away). Stack greens flat as you go. Once you have a nice stack, roll it up and cut in half-inch strips (this is a chiffonade if you want to get all fancy). Repeat until all greens are cut. Chop bacon and saute in the bottom of a Dutch oven or other LARGE pot. Once bacon has crisped a bit, add chopped red onion and saute until translucent. Add brown sugar (amount depends on how sweet you like it–I use 2-3 tablespoons), vinegar, and red pepper flakes. Stir well and begin layering in your greens. They may not all fit at first, let them wilt a few minutes and stir them down until you can get them all in there. Turn the greens so they’re nicely coated with all the goodness in the bottom of the pan. Add no more than a cup of chicken stock and simmer, covered, for a loooong time–at least two hours. Stir every 30 minutes or so until the greens are tender, a deep almost muddy green, and delicious! Serve hot with cornbread to sop up the pot likker. 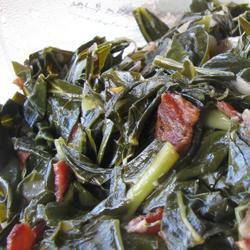 sure would love a pot of your collards with some crusty bread to sop up the juice!! Happy New Year to you and Jim. I think there’s a rule about only eating cornbread . . .
I’ve never had collards cooked any way but the way my mama makes them. I love hers, but I’d be willing to venture out into the unknown and try something new. Thank you, Sarah…I love your blog! I’m betting your mama’s collards are better than mine!